On Wednesday 26th April, Portsmouth College held their annual event to celebrate local apprentiships and to say thank you to all employers that support apprentiship schemes. It was such a fabulous evening and three course dinner held on top of Portsdown Hill at Fort Purbrook. To top off the evening and an amazing surprise we won an award for outstanding partnership with HAHA, our apprentice training partner. Kate Preston Salons have always supported and taken on apprentices in Hair and Beauty, at least two per year and our partnership with HAHA enables us to do this. HAHA, in their first year of establishment were nominated for Training Provider of the Year 2013 and since then have registered over 200 students and are still growing. All courses are City and Guild accredited, they have annual competitions for the apprentices and along with Kate Preston Salons, HAHA have achieved their 5 stars from the Good Salon Guide. 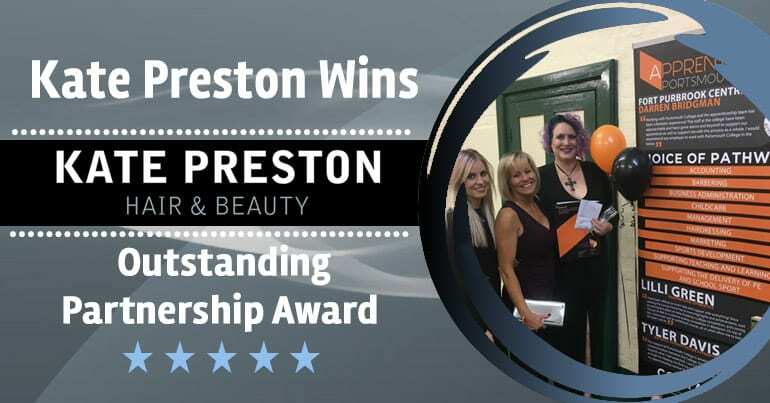 At Kate Preston our mission is to provide training and develop youngsters that have a passion for the hair and beauty industry. We offer extensive training in the salon as well as external training courses and feel that apprentiships are so great because it’s a chance to learn skills on the job which often enables quicker learning and development. Our apprentices have managed to progress extremely quickly completing their level 2 and 3 in half the time it usually takes. Last year our apprentice Jenny was finalist for Apprentice of the Year at The Small Business Awards 2016. We would love to give more opportunities this year. For information on our apprentiship scheme please contact Libby – Liberty@katepreston.co.uk.